Peugeot's Back in the Philippines! The French carmakers are back! And they&rsquo;ve brought with them some really nice rides! With that out of the way, we’re here to announce that, after almost two decades of absence, Peugeot, the second-largest selling automotive brand in Europe, is back in the country! This resurgence we owe to its exclusive local importer and distributor Eurobrands Distributor Inc., an affiliate of Columbian Group of Companies. Yes, the same dudes who continuously regale us with the latest from BMW and Kia are also the ones behind this new automotive juggernaut. 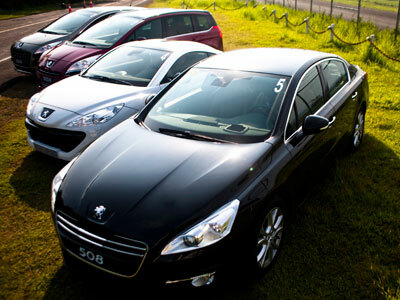 Peugeot is the world’s largest producer of diesel engines. In fact, we heard that they’ve gotten so good at diesel engines—the Peugeot nerds call it a micro-hybrid technology—that they’re now churning out engines that can preserve and maintain high levels of efficiency while minimizing the fuel’s harmful effects. Diesel engines also mean cheaper fuel. Cheaper fuel means you’ll have more money for beer! Hooray! If you’re a car buff, you must also know that Peugeot engines use a diesel particulate filter system. For non-car buffs this means that these engines can cut drastically much of the harmful CO2 emissions that are the bane of diesel-powered cars. Remember the Peugeot 205? Actually, you shouldn’t, because that one came out in the early ’80s. The point here is that the 205 was voted as ’80s Car of the Decade. In short, their history spells e-x-c-e-l-l-e-n-c-e.
Here’s another one for you car buffs: You know how we all raved about diesel engines finally being available in sleeker cars (read: not a jeepney)? Well, Peugeot’s obsession with diesel fuel probably had a hand in that happening. After all, their cutting-edge research in diesel technology brought the car world the HDi engine or High-pressure Diesel Injection system, which preserves much of the diesel engine’s traditional characteristics—economy, range and toughness—while minimizing much of its disadvantages—Inang Kalikasan-killing CO2 emissions. And, lastly, they make really pretty cars! But we won’t bludgeon you with more words to prove this one. Instead, we offer you pictures! Click through the gallery below for an exclusive look at Peugeot’s lineup of cars for its Pinas comeback! Shell Joins Forces with LEGO and Ferrari!